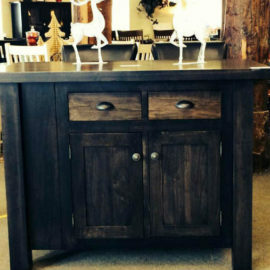 Combine storage and additional seating with one of our beautiful kitchen islands. Configure yours with any combination of drawers and doors so you have the storage space you need. 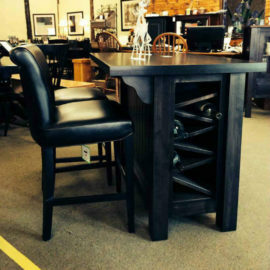 Add a wine rack along the side for convenience and style! Our islands exude quality, whether you prefer rustic charm or sleek modern style. Handcrafted from solid wood by expert Mennonite and Amish furniture makers. Full extension glides and four corner English dovetailed drawers are just some of the quality features. We’ll stain your island in the perfect colour to complement your decor so you have a look you’ll love for years. Styled for today; constructed for life!